Early in my career, before joining Vista Living Senior Care in Arcadia, I was fortunate to discover the importance of this question. For most children of aging parents this is the first question to ask yourself and will guide the process of finding the best options for their Senior Care. Studies reveal that 25% of caregivers live with the elderly or disabled relative that he or she cares for. This arrangement can have many benefits, but there is a point in time when it can also begin to cause more expense, fatigue, heartache and stress, especially if your home has to go through a remodel for needed accommodations or modifications. 1. What kind of care will be needed? It’s important to consider the person’s mental and physical condition, and any illnesses he or she may have, before you move him or her into your home. However, moving parents out of their family home usually happens when there is some sort of health condition or crisis that acts as a catalyst for the transition. If this is the case, your family will be dealing with the person’s chronic illness, which will most likely get worse and eventually require round-the-clock care. It’s important to think about the future senior care needs to determine whether a move into assisted living may be a better option. 2. Realistically, how much personal assistance and supervision can you provide? Many families feel obligated, or even want, to bring their elderly loved ones into their home when their health declines. 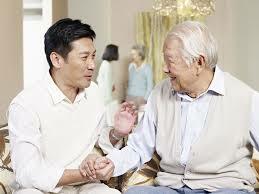 Many feel caring for an aging relative is a great way to give back some of the care, love and nurturing he or she may have given you. But role-reversal can be challenging for everyone involved; not only for you, noone wants to be a burden and feel uncomfortable with you having to care for them. • Be realistic — You may consider speaking to your elderly relative’s doctor about his or her upcoming needs and determine whether you’re able to provide the level-of-assistance needed. • Consider your schedule — Do you work? Do you have children? You need to consider whether you actually have time to watch someone who requires assistance. Do you have someone who can help you? There is no guilt in asking questions that you need to ask. • Know your limits — If the person needs help with activities of daily living (ADLs), such as bathing and dressing, are you and your loved one comfortable with you performing these duties as caregiver? Do you feel your best, current option is hiring in-home aide or nurse until the need for more care makes it because necessary to have your loved one move into a senior care facility? 3. What’s your relationship like? Do you get along well with your loved one or relative? You need to look at the history of your relationship and determine whether or not you can reside in the same house, let alone have you care for their needs. If you can move past conflict easily and feel living together will only strengthen bonds without sacrificing your sanity in the process, the arrangement may work. However, if you’ve never gotten along, putting yourself in close quarters probably isn’t a good idea, even if you feel obligated, you have to be realistic. 4. Can your home accommodate the person’s care needs today and in the future? • Could you convert the living room or den into a bedroom easily? • Is there a bathroom available on the floor the relative will be residing? • Is the bathroom and hallway areas wheelchair accessible? • What renovations will be needed, and is the cost worth it for both short-term and long-term health and senior care needs? • Will everyone have a level of privacy they’re comfortable with? 5. How do your other family members really feel about the potential move-in? You have to go with your gut when it comes to moving in your aging relative. Do you and your children feel excited about the potential move-in? Does your spouse have a good relationship with the relative? How does he or she feel about the move-in? You want to make sure everyone is on-board with the decision and is prepared for potential sacrifices and responsibility. Consider meals, noise levels in the house and everyone’s preferences and styles. Can family members adapt to be compatible to accommodate multiple generations, in addition to possible care? 6. Will you have enough time to care for yourself? If you’re working full time, you need to seriously consider whether you can handle the additional stress of having a dependent, older adult at home. Being a caregiver is hard work that many people don’t realize until they’re in the situation. Many caregivers have lost or given up their jobs because they can’t juggle competing demands of work and taking care of an older adult. They are also prone to illness from exhaustion and stress if they’re not taking time for themselves. It’s important to replenish your own body, mind and spirit by having your own activities and time. You need to consider whether you can balance everything. There are many support groups for caregivers, both in-person and online. It helps to realize you’re not alone in what you’re going through. 7. Your elderly loved one, what kind of social life will this arrangement offer them? When a relative moves in with you, he or she may be leaving his or her own social network and friends. Not only that, it can be especially hard for some older people to adjust to a new environment, especially if they’re set in their ways. Depression and loneliness from isolation could become an issue. During your Senior Living career you have the pleasure of meeting many wonderful seniors and families, we still enjoy and recognize the reaction of a visiting family member or loved one commenting: she or he was in a hurry to have a meal with their friends. Vista Living Senior Care believes a social life for seniors is very important and you’ll need to understand they can and may greatly benefit and thrive in an environment with friends their own age. Families opt to move their aging loved one or relatives into assisted living — where there is 24-hour access to personal care, as well as nutrition and wellness services designed specifically for older adults. Seniors can enjoy social contact, security and support while still maintaining their independence. If you’re still on the fence and struggling with the answer, then its down to 2 things: Care & Cost. Notice Care first, it’s only fair to ask, “Will someone else be able to provide the same level of care that I do?” Vista Living Senior Care Arcadia believes we can, and affordably. We urge you to consider Vista Living Senior Care for your family. Please schedule a tour of one of our purpose built 10-resident Luxury Senior Care Communities in the Phoenix Arcadia area, between Scottsdale & Biltmore. We know we have something special. Let us show you. For more information please call Vista Living Senior Care at our main line at (602) 456-1919 or email info@vistaliving.net.